These babies are all over the place now. I won’t be surprised if they eventually outnumber all of the preservation ordinance signs put together. Whether or not that has an effect, we’ll have to see. If yard signs aren’t enough for you, there’s also pro-Wal-Mart mail pieces, which are apparently being sent to people who are most likely opposing that project. We received ours on Thursday. Hey, if they want to waste their money, I won’t try to stop them. This is a tactic they’ve used before, by the way, though apparently with different stock photos. 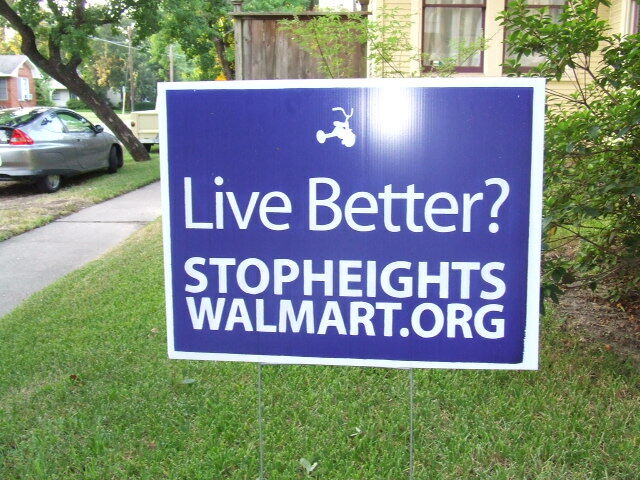 I think I’ll take the Stop Heights Wal-Mart folks’ advice for what to do with my response card. Hair Balls has more. 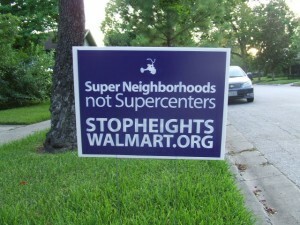 In related Wal-Mart news, Swamplot cites a KPRC story in which a Wal-Mart flak raises some lame questions about who it is that is opposing them, to which They Are Building A Wal-Mart On My Street pushes back. It’s going to get a lot more fun from here on, isn’t it? And finally, meet Responsible Urban Development for Houston, also known as RUDH. Posted in: Elsewhere in Houston. I don’t doubt there is a lot of grassroots opposition to the Walmart. However, I also don’t doubt that there are some outsiders who hate the evil empire Walmart also in the mix. It seems to be a big waste of breath. City hall has pretty much given them the sympathy nod and said they hear their opposition but couldn’t stop it even if they wanted. @ Ron, While its true the CoH can’t outright block developments, they can set standards for the development that must be met. Furthermore, Any tax incentives (380 Agreement) going to the developer must be approved by the City and there is discretion there. Lastly, the developer is requesting Variances on the surrounding streets that are subject to review and discussion by the City. In short, they could probably try and build up on the land as it is ‘now’, without any support from the city; however, that’s not what they want to do and they are essentially opening the door to opposition voicing their opinion on the incentives and variances. Ashbyhighrise is a good example. The city approved a smaller version of the developer’s plan which was less attractive to build and thus, they are now suing the city. Sure, officially and publicly, it is still supposed to be going up, but given this economy, I’d be surprised if they still have residents willing/able to purchase now and with the changes made. Both developers (ashby’s and ainbinder) would be better off flipping the property to a community acceptable tenant/plan than waste time and money fighting the community and the city. They may get a little less per sq ft, but the money they’re spending on PR, legal, etc has a legit cost too they have to count. Ashbyhirise and Walmart are really apples and oranges. When the economy tanked there was likely little chance that those hi-rises would be built as planned. Here’s one that bother’s me – The city approved a smaller version of the developer’s plan which was less attractive to build and thus, they are now suing the city. – and when the city loses who pays? 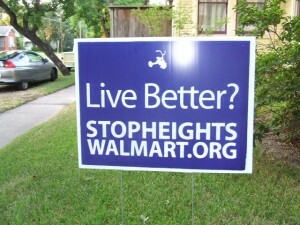 It’s not just you guys that don’t want a Walmart in your back yard, it’s everybody in the city. The reality is that there are no laws to stop the Walmart. You can get the city to pull some not so legal stunt that will likely end up costing the taxpayers a lot of money, but that’s rather cutting your nose off in spite of your face. It may win the little war of delaying or modifying what’s already a done deal, but in the long run it’s not in everybody’s best interests. I appreciate you guys not wanting a Walmart close to you generating all that traffic. I hope in this you’ll consider the interests of all the city’s taxpayers and not just your narrow interests of not in my back yard. Ron, one concern a lot of people have has to do with the impact on drainage and flooding. The surrounding streets have drainage ditches. If nothing else, the city can ensure proper infrastructure upgrades are made before any construction begins. If it happens that the required upgrades make a Wal-Mart less attractive to build there, well, that’s not a tragedy.